In 2016, global flows of foreign direct investment fell by about 2 per cent, to $1.75 trillion. Investment in developing countries declined even more, by 14 per cent, and flows to LDCs and structurally weak economies remain volatile and low. Although UNCTAD predicts a modest recovery of FDI flows in 2017–2018, they are expected to remain well below their 2007 peak. These developments are troublesome, especially considering the enormous investment needs associated with the Sustainable Development Goals, detailed in UNCTAD’s Action Plan for Investment in the SDGs. Progress on sustainable development – and lasting peace – requires more investment in basic infrastructure, energy, water and sanitation, climate change mitigation, health and education, as well as investment in productive capacity to generate jobs and income growth. Now more than ever it is important to ensure that the global policy environment remains conducive to investment in sustainable development. UNCTAD plays an important role in this, by providing guidance on national and international investment policy regimes. Its Investment Policy Framework and Roadmap for Reform of International Investment Agreements have been used by more than 130 countries in formulating a new generation of investment policies. This year’s World Investment Report builds on that track record and presents policy advice on how to deal with close to 3,000 old-generation investment treaties. A key challenge for policymakers in today’s global economy is digital development. 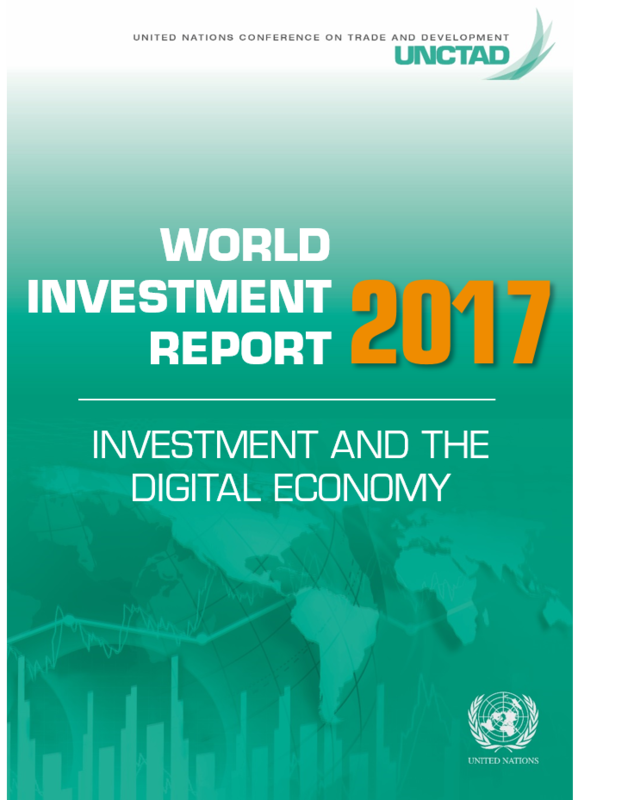 The theme chapter of the Report this year shows that the digital economy is having a major impact on global patterns of investment. It provides important insights on the implications of the digital economy for investment policies designed for the analogue era, and suggests how investment policy can support digital development. I commend this Report as an important tool for the international investment and development community. Higher economic growth expectations across major regions, a resumption of growth in trade and a recovery in corporate profits could support a small increase in foreign direct investment (FDI). Global flows are forecast to increase to almost $1.8 trillion in 2017, continuing to $1.85 trillion in 2018 – still below the 2007 peak. Policy uncertainty and geopolitical risks could hamper the recovery, and tax policy changes could significantly affect cross-border investment. Developing economies as a group are expected to gain about 10 per cent. This includes a sizeable increase in developing Asia, where an improved outlook in major economies is likely to boost investor confidence. FDI to Africa is also expected to increase, with a modest projected rise in oil prices and advances in regional integration. In contrast, prospects for FDI in Latin America and the Caribbean are muted, with an uncertain macroeconomic and policy outlook. Flows to transition economies are likely to recover further after their economies bottomed out in 2016. Flows to developed economies are expected to hold steady in 2017. FDI inflows decreased by 2 per cent to $1.75 trillion, amid weak economic growth and significant policy risks, as perceived by multinational enterprises (MNEs). FDI remains the largest and most constant external source of finance for developing economies – compared with portfolio investments, remittances and official development assistance. Inflows rose by 5 per cent to $1 trillion. A fall in FDI in Europe was more than compensated by modest growth in North America and a sizeable increase in other developed economies. Developed economies’ share in global FDI inflows grew to 59 per cent. Inflows to the G20 reached a record of more than $1 trillion for the first time. Intragroup FDI is a growing feature in some groups. Slower growth in international production contributed to lacklustre global trade expansion the last five years of foreign affiliate sales (7.3 per cent), value added (4.9 per cent) and employment (4.9 per cent) were all lower than in the equivalent period before 2010 (at 9.7 per cent, 10.7 per cent and 7.6 per cent, respectively). About 1,500 State-owned MNEs (1.5 per cent of all MNEs) own more than 86,000 foreign affiliates, or close to 10 per cent of all foreign affiliates. They announced greenfield investments accounting for 11 per cent of the global total in 2016, up from 8 per cent in 2010. Their headquarters are widely dispersed, with more than half in developing economies and almost a third in the European Union. China is the largest home economy. Reaching $59 billion, down 3 per cent from 2015, mostly reflecting low commodity prices. This first decline in five years was relatively widespread, with double-digit drops in most subregions except South Asia. With inflows falling 14 per cent to $142 billion, owing to continued economic recession, weak commodity prices and pressures on exports. It reflecting large privatization deals and increased investment in mining exploration activities. They declined by 11 per cent to $1 trillion, mainly owing to a slump in investments from European MNEs. Outflows from North America remained flat, but those from developed countries in Asia-Pacific reached their highest level since 2008. The flow of outward investment from developing economies registered a 1 per cent decline to $383 billion, despite a surge of outflows from China, now the second largest investing country in the world. Flows to the least developed countries fell by 13 per cent, to $38 billion. Similarly, those to small island developing States declined by 6 per cent, to $3.5 billion. Landlocked developing countries saw stable FDI, at $24 billion. Sustainable development considerations make investment policies more challenging and multifaceted. Policymaking is also becoming more divergent, reflecting the variety of approaches with which societies and governments respond to the effects of globalization. This, together with more government interventions, has also reduced the predictability of investment policies for investors. A rules-based investment regime that is credible, has broad international support and aims at sustainability and inclusiveness can help reduce uncertainty and improve the stability of investment relations. Some 58 countries and economies adopted at least 124 investment policy measures – the highest number since 2006. Entry conditions for foreign investors were liberalized in a variety of industries, and numerous countries streamlined registration procedures, provided new investment incentives or continued privatization. About one fifth of the measures introduced new investment restrictions or regulations, considerably more than in the early stages of UNCTAD’s annual reporting in the 1990s. They were manifested not only in new legislation but also in administrative decisions, especially in the context of merger controls involving foreign takeovers. At least 108 countries have such a law. Investment laws and IIAs share common elements in preambles, definitions, entry and treatment of investors, investment promotion and dispute settlement. Reform of IIAs and modernization of corresponding clauses in investment laws should go hand in hand. In 2016, 37 new IIAs were concluded, bringing the total number of treaties to 3,324 by year-end (an additional 4 have already been concluded during 2017). Over the same time, terminations of at least 19 IIAs became effective, with more to come. All of this reflects governments’ broader re-adjustments of their international investment policy engagement. In 2016, 62 new cases were initiated, bringing the total number of known cases to 767. As of the end of 2016, investors had won 60 per cent of all cases decided on the merits. Drawing on UNCTAD’s Investment Policy Framework for Sustainable Development, the non-binding G20 Principles represent the first time that multilateral consensus on investment matters has been reached between a varied group of developed, developing and transition economies, accounting for over two thirds of global outward FDI. Consolidating phase 1 of IIA reform, most new treaties follow UNCTAD’s Road Map (WIR16), which sets out five action areas: safeguarding the right to regulate, while providing protection; reforming investment dispute settlement; promoting and facilitating investment; ensuring responsible investment; and enhancing systemic consistency. Reforming dispute settlement is high on the agenda, with concrete steps undertaken (e.g. reform-oriented clauses in new treaties, work on the establishment of an international investment court), including at the multilateral level. Investment facilitation has become an area of increased interest, and UNCTAD’s Global Action Menu on Investment Facilitation has obtained strong support from all investment and development stakeholders. Moreover, recent treaties include new language that preserves host States’ right to regulate or fosters responsible investment. Old treaties abound: more than 2,500 IIAs in force today (95 per cent of all treaties in force) were concluded before 2010. Old treaties “bite”: as of end-2016, virtually all known ISDS cases were based on those treaties. And old treaties perpetuate inconsistencies: their continued existence creates overlaps and fragmentation in treaty relationships and poses interaction challenges. 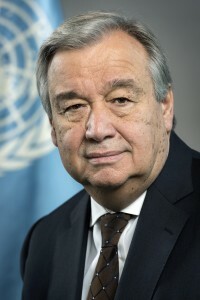 (1) jointly interpreting treaty provisions; (2) amending treaty provisions; (3) replacing “outdated” treaties; (4) consolidating the IIA network; (5) managing relationships between coexisting treaties; (6) referencing global standards; (7) engaging multilaterally; (8) abandoning unratified old treaties; (9) terminating existing old treaties; and (10) withdrawing from multilateral treaties. Countries can adapt and adopt these options to pursue the reforms set out in the Road Map in line with their policy priorities. It addressing a number of broader challenges. Strategic challenges include preventing “overshooting” of reform, which would deprive the IIA regime of its purpose of protecting and promoting investment. Systemic challenges arise from gaps, overlaps and fragmentation that create coherence and consistency problems. Coordination challenges require prioritizing reform actions, finding the right treaty partners to implement them and ensuring coherence between reform efforts at different levels of policymaking. Capacity challenges make it hard for smaller countries, particularly least developed countries, to address the deficiencies of old-generation IIAs. UNCTAD, through its three pillars of work – research and policy analysis, technical assistance and intergovernmental consensus-building – can play a key role, as the United Nations’ focal point for international investment and the international forum for high-level and inclusive discussions on today’s multilayered and multifaceted IIA regime. These policies and instruments are emanating primarily from stock exchanges and their regulators, but with strong involvement from other capital market stakeholders such as institutional investors. Stock exchanges are positioned to influence investors and companies in a way few other actors can – through new products and services, as well as through support for regulators in promoting the adoption of market standards. It can provide a boost to competitiveness across all sectors, new opportunities for business and entrepreneurial activity, and new avenues for accessing overseas markets and participating in global e-value chains. It also provides new tools for tackling persistent development problems. Yet, it comes with a host of policy challenges, including the needs to bridge the digital divide, minimize potential negative social and development impacts, and deal with complex internetspecific regulatory issues. The opportunities and challenges associated with the digital economy are particularly important for developing countries. The adoption of digital technologies has the potential to transform the international operations of MNEs and the impact of foreign affiliates on host countries. And digital development in all countries, and in particular the participation of developing countries in the global digital economy, calls for targeted investment policies. Between 2010 and 2015, the number of tech companies in UNCTAD’s ranking of the top 100 MNEs more than doubled. The assets of these MNEs increased by 65 per cent and their operating revenues and employees by about 30 per cent, against flat trends for other top 100 MNEs. The importance of digital MNEs – including internet platforms, e-commerce and digital content firms – is also growing rapidly. WIR17 presents a new top 100, ranking digital MNEs and their international production footprint. The impact of digital MNEs on host countries is less directly visible in physical investment and job creation, but their investments can have important indirect and productivity effects, and contribute to digital development. Depending on industry- and MNE-specific preferences, it can lead to fewer large investments in centralized, “big-data-enabled” production, but also to nimbler, distributed, 3D printing production. It can lead to reshoring but also to more services outsourcing. And it can lead to reconfiguration of supplier relationships in host countries, as well as new partnership opportunities. Of the top 10 traditional industries most affected by digitalization, 5 coincide with the top 10 industries in which countries maintain investment restrictions (mirrored in IIA reservations) – and digital MNEs are expanding into other regulated sectors. Some analogue-era regulations may need to be reviewed to avoid that they become obsolete or an unintended drag on digital adoption. WIR17 contains the findings of a survey of the investment dimension in more than 100 national and regional digital development strategies. Less than 25 per cent contain details on investment requirements for infrastructure, and less than 5 per cent on investment needs beyond infrastructure, including for the development of digital industries. Investment promotion agencies are rarely involved in the formulation of digital development strategies. Infrastructure investment requirements for achieving adequate connectivity for most developing countries could be less daunting than often supposed; UNCTAD estimates the investment costs associated with near universal basic 3G coverage in those countries (a prerequisite for the SDG universal access target) at less than $100 billion. Regional cooperation for investment in internet infrastructure can make infrastructure projects more attractive for international investors. This means creating and maintaining a conducive regulatory framework for digital firms, as well as active support measures, which may include technology or innovation hubs and incubators; building or improving e-government services; and supporting venture capital funding and other innovative financing approaches. Linkages with global firms can help, but developing the digital sector mostly means supporting local enterprise development, rather than promoting investment by digital MNEs. Tariffs and taxes on devices, and taxes on internet usage, also influence the effective costs of ICT adoption for firms. Facilitating access to cloud services can lower such costs. Skills development – potentially in partnership with global digital MNEs – is also important to allow local firms to interact digitally with MNEs and access e-value chains. This requires up-to-date regulations in such areas as data security, privacy, intellectual property protection, consumer protection and the safeguarding of cultural values. Where digital transformation causes disruption in other sectors or generates negative social or economic impacts, they need to put in place policies to mitigate these effects. Governments need to find a balanced approach that accommodates both public concerns and the interests of private investors. Not only should they prepare for critical changes in their own policy arena, but they can also make an important contribution to the design and implementation of digital industrial policies. Digital development should be embedded in investment policies, and investment policy should be embedded in digital development strategies.